DDP integrates research in the areas of attachment theory, developmental trauma, the neurobiology of trauma, attachment and caregiving, intersubjectivity theory and child development. Since Dan Hughes first developed DDP over 30 years ago, much has been written about how and why these theories, and the research associated with them, have influenced the development of the therapy and subsequent treatment models. 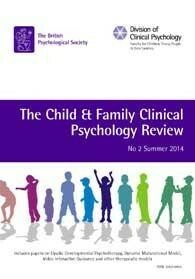 A comprehensive summary of the evidence base was published by the British Psychological Society, Summer 2014. “Dyadic Developmental Practice (DDP): A framework for Therapeutic Intervention and Parenting” briefly describes the model before discussing the range of ways that DDP is influencing practice in the UK. Case studies are used to illustrate this and the evidence base is described. An up-to-date listing of all published research can be found on our Published Research page. DDPI recognizes the need to build stronger empirical evidence for the efficacy of DDP. Randomized Controlled Trials require significant amounts of time and money and, as yet, there are no evidence-based treatments for childhood complex trauma suggesting that such evidence is very difficult to acquire. Interventions involving abused and neglected children need to be especially concerned with the children’s safety and focus both on trauma resolution as well as new relationship skills. DDP is a “science informed” model of treatment that uses relational processes consistent with a large body of neuroscientific research which shows that a highly nurturing, attuned, responsive form of parenting promotes healthy brain development and the formation of strong emotional bonds between parents and children. Even as we await robust evidence-based research about the clinical efficacy of DDP, the DDPI Board is committed to ensuring that DDP is aligned with the latest research in the areas of social developmental neuroscience , the neurobiological impact of early life stress, and the emerging neuroscience of psychotherapy that seeks to identify the “active ingredients” that facilitate positive outcomes in treatment. As a board we have made it a priority to demonstrate empirically what clinicians and families are observing anecdotally: that DDP facilitates the emotional safety required to help children move from distrust of adults to trust and towards a more secure attachment. It is also a priority to demonstrate that DDP is a respectful and safe treatment and in no way further endangers a child. Our work is closely aligned with the work of Alan Schore, Colwyn Trevarthen and Daniel Stern who provide the theoretical underpinnings and evidence for the essential nature of the therapeutic, attuned relationship. DDPI is developing a comprehensive use of single case studies, practice-based evidence where the results of DDP are demonstrated in pretests, posttests, and follow up measures of treatment conducted by therapists certified in DDP by DDPI. The therapeutic relationship is central in the effectiveness of DDP. Therapeutic relationships, which are themselves evidence-based, are those characterised by a strong therapeutic alliance, empathy, and unconditional positive regard. All three of these are central in the training and practice of therapists certified in DDP through DDPI. Continuing to join the practice of DDP with the extensive research involving attachment, trauma, and intersubjectivity, and the nature of the therapeutic relationship provides a “face validity” that might well warrant further study of DDP. 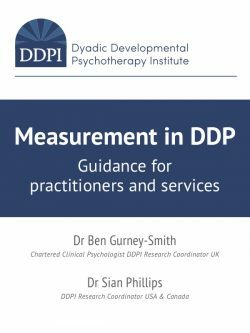 The Measurement in DDP Guidance document is designed to encourage the evaluation and understanding of DDP in a number of settings but in line with the core elements of the model. The guidance was developed as part of the DDPI’s commitment to the development of an evidence base for DDP. Kim Golding has developed and run parenting groups for adoptive and foster parents for over 10 years. A key component of her group work programme, called Fostering Attachments, now published as “The Nurturing Attachments Training Resource”, is the relationship between a parent and his or her child. This study explores and evaluates the efﬁcacy of the therapeutic parenting model, including the use of PACE, delivered within The Nurturing Attachments groupwork programme. In 2016 the UK Government’s DfE funded Adoptionplus to carry out an evaluation of the programme across 4 geographical sites for adoptive families. 1. The therapy relationship makes substantial and consistent contributions to psychotherapy outcome independent of the specific type of treatment. 2. The therapy relationship accounts for why clients improve (or fail to improve) at least as much as the particular treatment method. 3. Efforts to promulgate best practices or evidence-based practices (EBPs) without including the relationship are seriously incomplete and potentially misleading. Evaluate currently unevaluated but extensively used interventions for attachment difficulties. Various interventions are currently used to help address attachment difficulties that may be clinically effective, but without good quality evidence they cannot be considered by NICE. A randomised controlled trial should be carried out that compares currently unevaluated interventions, such as playtherapy, dyadic developmental psychotherapy, and attachment aware schools program with an evidence‑based treatment for attachment difficulties. The interventions should address children in a wide variety of placements and ages. There should be at least a 6‑month to 1‑year follow‑up. Potential harms also need to be captured. Qualitative data may also be collected on the parents’ and child’s experience of the intervention. Previously, DDP practitioners have been asked for their families to complete six questionnaires prior to beginning treatment and after 6 months of treatment. We have considered the benefit and research basis for asking practitioners to evaluate their work using a list of DDPI measures to build a body of data concerning effectiveness and outcomes. The Research Co-ordinators of DDPI have considered the viability of this study and also have considered the findings from a survey of practitioners who have returned their views on the list of DDPI suggested measures. This has helped refine the list of measures we have now selected for use and also to conclude that supporting individuals and services, rather than holding responsibility for this evaluation is the best way forward. DDPI are keen to develop an evidence base and so we are working to see a randomised controlled trial of DDP as the gold standard of evidence. Until this time, we also firmly believe that this process of gathering evidence will be helped, in part, by supporting individuals and services using DDP by suggesting clinically viable, applicable measures driven by the theoretical underpinnings of the model. We have produced new guidance based on this and studies evaluating DDP informed services. Please see our Measurement in DDP Guidance document. Our Research Coordinators in the UK and USA & Canada are willing to offer support in using these measures to develop evaluation projects suitable for dissemination and publication. Please contact Matt Hudson (Assistant Psychologist for DDPI) in the first instance.